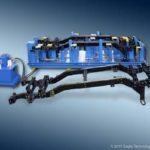 The ride and handling of your vehicle depends upon quality chassis components and assemblies just as your manufacturing processes depend upon quality manufacturing equipment. 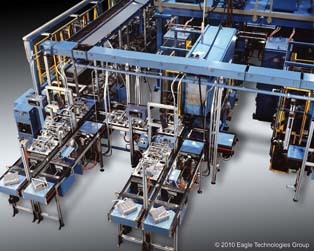 Eagle has been manufacturing high quality chassis component assembly and test equipment for decades. 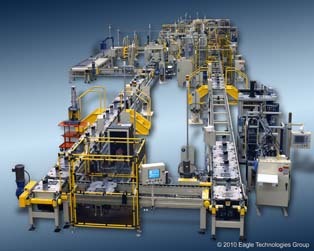 From lean manufacturing stations and fixtures to fully automated production lines we have the expertise and experience to develop just the right solution for your manufacturing needs. 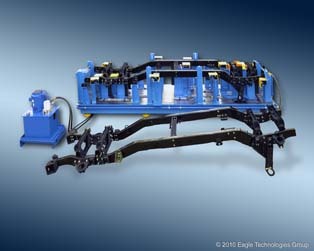 The customer needed to get eleven main frame components into correct position for this military personnel carrier chassis to be assembled to print. 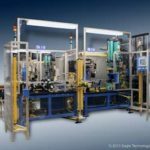 Issues included bolt hole locational tolerance, component warp due to welding, ease of loading and unloading. By far the largest challenge was to get the body mounts into the correct position so the body could mount properly later in the assembly process. 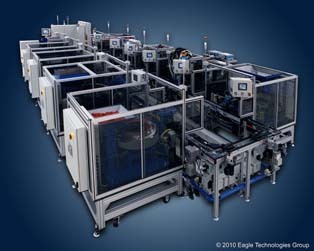 Eagle Technologies provided an assembly fixture with hydraulic clamping that forced all eleven frame components into their intended design position. Components were clamped in place while operators used impact wrenches to tighten the 106 bolts required to secure the frame together. 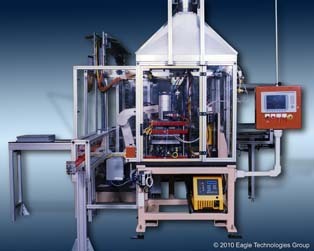 All frame to body mount locations were held within required tolerance in spite of component variation. The fixture also provided easy access for loading, unloading and access to the bolts.